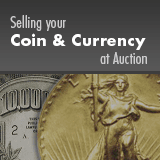 DC-25i $1 1923 Two Examples PMG About Uncirculated 53; PMG About Uncirculated 55 Net. Both of these notes have Bronze seals and are from Group 2, Series B. The net graded example is noted as having Minor Rust (which is apparently a speck in the lower left margin near the corner).